Slow and steady may not always win the race, not when an insulin injection is needed to control diabetes. Although fast-acting synthetic versions of human insulin have been available since 1996, they may not be fast enough, taking 15 to 30 minutes to become effective. An even faster version of insulin, however, may be gaining on today’s fastest-acting synthetic. And it emulates something not known for being particularly speedy—a snail. To be fair, the snail in question, Conus geographus, may not move quickly, but it produces a fast-acting venomous cocktail, which happens to consist, in part, of a unique form of insulin. 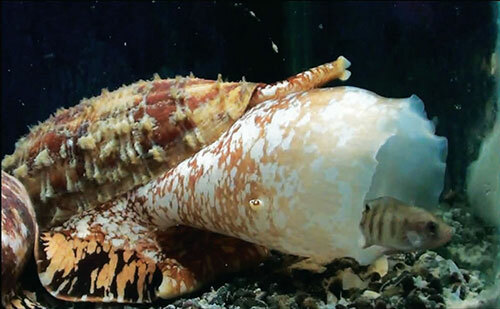 This species, a kind of marine cone snail, makes use of its insulin-laced venom to quickly subdue its prey, nearby fish. When they swim through water into which the venom has been dispersed, fish may go into excitotoxic shock, a kind of hypoglycemic sedation. Stunned and helpless, they are then engulfed and consumed. The cone snail venom insulin, reports a team of Australian and American researchers, may begin working in as few as 5 minutes, as much as three times faster than currently available therapeutic insulins. The researchers also indicate that they have determined the three-dimensional structure of the cone snail venom insulin. The findings appeared September 12 in the journal Nature Structural & Molecular Biology, in an article entitled, “A Minimized Human Insulin-Receptor-Binding Motif Revealed in a Conus geographus Venom Insulin.” The article explains how a highly efficient natural protein, Con-Ins G1, can operate faster than human insulin. In other words, cone snail venom molecule is a relatively streamlined version of insulin. “We found that cone snail venom insulins work faster than human insulins by avoiding the structural changes that human insulins undergo in order to function—they are essentially primed and ready to bind to their receptors,” said Mike Lawrence, Ph.D., an associate professor at Melbourne's Walter and Eliza Hall Institute of Medical Research. The insulin molecule consists of an A region and a B region. But a part of the B region causes insulin molecules to stick together and form aggregations of six insulin molecules. It is how insulin is stored in the pancreas. But injected insulin must deaggregate into individual molecules before doing a person any good—and that process can take up to an hour. Scientists still need to conduct experiments to measure how quickly snail insulin, or a modified human insulin, would work when injected into an organism. Fish are affected almost instantly because the insulin passes over the gills. In humans, the process may take a few minutes longer. Another University of Utah scientist, Danny Chou, Ph.D., studies human insulin for use in an artificial pancreas device that could automatically deliver insulin in response to changing blood sugar levels, much as the natural organ does. The first generation of such a device may be available as soon as next year. Cone snail-inspired insulin, although “still not as good as we want for human use,” Dr. Chou admitted, could replace the current fast-acting insulin used in artificial pancreas development.